ABSAF racing cylinder head with special combustion chamber for better flow and more even combustion. There are three different kinds of cylinder heads. • Type 1: the standard cylinder head. Cast in aluminium, like all our castings it undergoes a special procedure to eliminate porosity. Compared to the original BSA DBD34 cylinder heads it has improved inlet and exhaust ports, aluminium bronze valve seats and a 10mm, more centrally placed spark plug for faster combustion to reduce the need for pre-ignition. This has a positive effect on both the petrol consumption and the durability of the engine. It can be used to replace an original cylinder head without any machining or other modifications. Valve guides are made of high quality phosphor bronze. The valves themselves are one piece stainless steel forgings, with a durable coating to reduce the effects of wear - far superior to the hardchroming that is often used elsewhere. Both the inlet and exhaust valves have a 5/16" diameter shaft. Valve guides and spring seats are also 1st class, able to cope with high revs and high temperatures. • Type 2: the 600cc cylinder head, including all the above named improvements, but made specially for the 600cc engine. 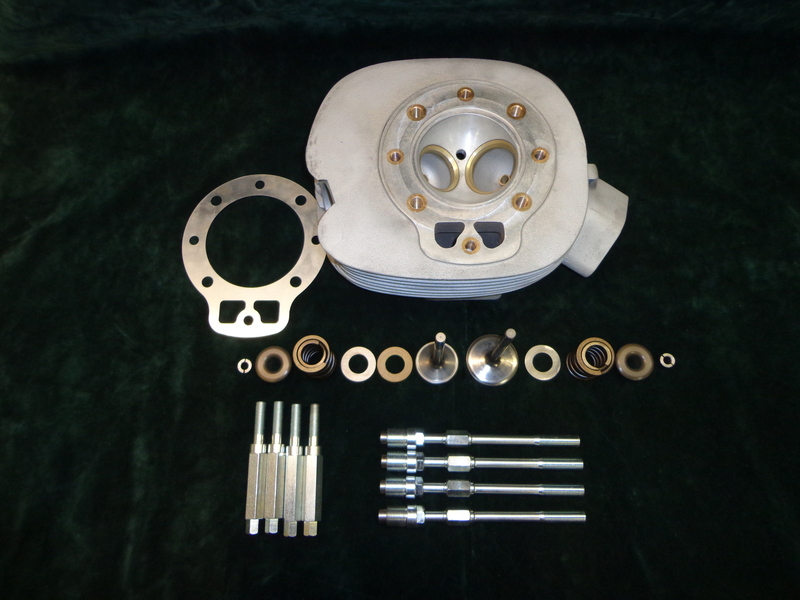 As the 600cc cylinder has a slightly larger diameter, the surface of the cylinder head where it connects to the cylinder has been adapted accordingly. • Type 3: the racing cylinder head, this extremely efficient cylinder head has somewhat decreased valve angles compared to the original version, and a completely remodelled combustion chamber. The inlet and exhaust ports have been modified and improved valve diameters for effective gas flow. This cylinder head can only be used in conjunction with a special "flat" surfaced piston - made for us to modern standards - and our special racing reinforced cylinder barrel, which is 6mm shorter. The head is attached by means of 4 short bolts, like the original, and four longer bolts which screw into the crankcase by means of adapters. ABSAF racing valves and highest quality valve springs provide reliability under exceptionally wwwing circumstances.